Posted November 8, 2005 in Articles and Quetico Park People. At a special moment during a canoe trip in Quetico, you may have felt that you had arrived in a place where few, if any, people had ever been. It may have been at the end of an overgrown, seldom used portage, on the top of a ridge overlooking a spruce bog, or even in the early morning mist at a campsite on a heavily traveled lake. This feeling invites exploration, compels one to see what is around the next point of land, and to fine out what is over the next portage. The feeling that Quetico is a timeless, unspoiled landscape magnifies the urge to explore. This feeling of timelessness is enhanced by the presence of old-growth forests which contain some of the oldest red and white pines and white cedar in North America. In the southeast corner of the park, these old trees grow over some of the oldest bedrock in North America. This feeling of entering a fresh, unspoiled land is certainly understandable since Quetico is relatively undisturbed. There are roads only around the periphery, and almost half of Quetico has never been logged. Although Quetico has, to a remarkable degree, escaped the ravages of modern man, it has also played an important role in Canadian history. What gives Quetico its special quality is a unique blend of past and preent, history and geography. Here preserved like a gilded fly in amber, is the Canadian wilderness as the fur traders knew it centuries ago, the Canada that caught the imagination of Samuel de Champlain and the Chevalier de la Salle, the Canada that David Thompson surveyed and Alexander Mackenzie traveled. It is certainly exciting to canoe the same lakes, walk the same portages and use the same campsites as some of the most renowned and celebrated explorers in Canadian history. Thompson, Mackenzie and numerous other early travelers left journals that detail their trips through Quetico. J. Arnold Bolz wrote a captivating book called Portage Into the Past where he chronicles a canoe trip he took along the border route in 1958 and adds excerpts from journal entries of earlier travelers, both Canadian and American, on the same route. Here you can read Alexander Mackenzieís rapturous account of the attributes of Basswood Lake, and re-live trips down Crooked Lake with David Thompson, John Bigsby and Joseph Delafield. Jacques de Noyen was the first recorded European to see Quetico when he passed through in 1688 on his way to Rainy Lake. It is thought that he paddled up the Kaministiqua River from Lake Superior and crossed Quetico from French Lake to Lac la Croix. This route later became known as the Fort William route since it started on Lake Superior at the NorthWest Company post known as Fort William. La Verendre was the first European known to travel the southern edge of Quetico when he traversed the Grand Portage and headed west in 1732. This route became the main voyageur route and eventually became the obrder between Canada and the United States. The route that de Noyen used, an all-Canadian route, became the main voyageur route after the U.S. imposed a tax on goods going over the Grand Portage in 1801. The wave of French and English explorers that probed and prodded this area in the late 1600ís and early 1700’s were exploring land that was new to them. The land, however, had been occupied for thousands of years, and Europeans hired the Native Americans who lived in and knew the area to guide them through it. It is ironic that the first European explorers, who we usually think of blazing new trails through the wilderness, were guided through areas that were already well known. The Ojibwa drew maps for LaVerendre and other early European explorers and guided them down well used routes to the west. European explorers were primarily seeking economic gain for themselves or their employers and were apparently reluctant to give much, if any, credit to their Indian guides. They put themselves in the spotlight, and the contributions of the people who lived here long before the Europeans arrived were ignored. To de Noyen and the explorers, voyageurs and settlers that followed him, this area seemed to be occupied by a relatively small number of people. Parts of it seemed to be totally unoccupied. This was partly due to the rocky, glacier-scoured landscape that didn’t support agriculture or large herds of grazing mammals. There was, however, another major factor. Although European explorers moved quickly across North America from east to west, their viruses traveled even faster. It is estimated that European viruses reached Northwestern Ontario and northern Minnesota 50 years before the first Europeans. Smallpox, measles, influenza and a variety of other diseases that Native Americans had never previously encountered, ran rampant for two generations before de Noyen even arrived in this area. It is estimated that from two-thirds to nine-tenths of Native Americans died from diseases, many of them before they had ever seen a European. There are only guestimates of Native American populations in this area prior to the viral invasion. We do know, however, that the entire region was occupied and that numerous waves of epidemics, including a particularly horrific one in 1781, decimated local Native populations. The feeling of entering an unpopulated land, expressed by many European explorers, was understandable, but in retrospect we can see that they were entering a depopulated land. This was true for the Americans in general, not just this area. To find the earliest explorers of Quetico, we have to go back far earlier than Jacques de Noyen in 1688. He wasnít even close to being the first; he was thousands of years too late for that distinction. Evidence for earlier inhabitants of Quetico has been found on campsites, portages and cliff faces through the park. It isnít known for sure when people first entered Quetico, but it is thought that nomadic hunters followed caribou and other large mammals as they moved north in the wake of the retreating glacier. It’s possible that people lived in this area even before the last glaciation, but if they did, the glacier would have removed any evidence of their existence. The continental glacier that slowly melted at the end of the last ice-age, disappeared from Quetico about 11,000 years ago. The people who followed the retreating glacier have been given the name Paleoindians, although it is not known what they called themselves. They were entering a land that no human had ever seen and were Queticoís first true explorers. When the glacier reached its maximum size about 20,000 years ago it covered all of Ontario and most of Minnesota and Wisconsin. Very little is known about the Paleoindians who entered this area since only their stone tools have been found. They used very large and skilfully made spearpoints and scrapers. Their spearpoints were much larger than anything made in later time periods. Nothing is known about their objects made of wood, leather, bone or any other perishable material. Consequently, nothing is known about their lodging, clothing or transportation. It isn’t known if they had snowshoes, sleds, or canoes. The questions about transportation technology are obviously important ones, since getting around in this environment without snowshoes or canoes would have been exceedingly difficult. Since the Paleoindians successfully adapted to an environment that was covered in deep snow for half the year, and was as much water as land the rest of the year, it is safe to assume that they had both snowshoes and watercraft of some sort. 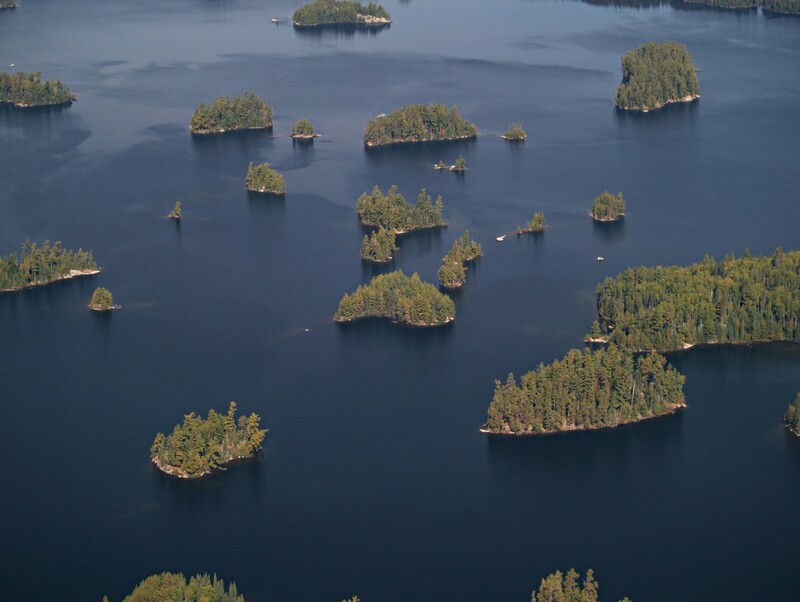 The Quetico that the Paleoindians explored was a much different place that it is today. The land was recently released from the glacier, and the glacier’s melting produced a huge amount of water. The flow of the water to the north and west was blocked by the glacier, so the water levels rose and formed a monstrous lake knows as Lake Agassiz. 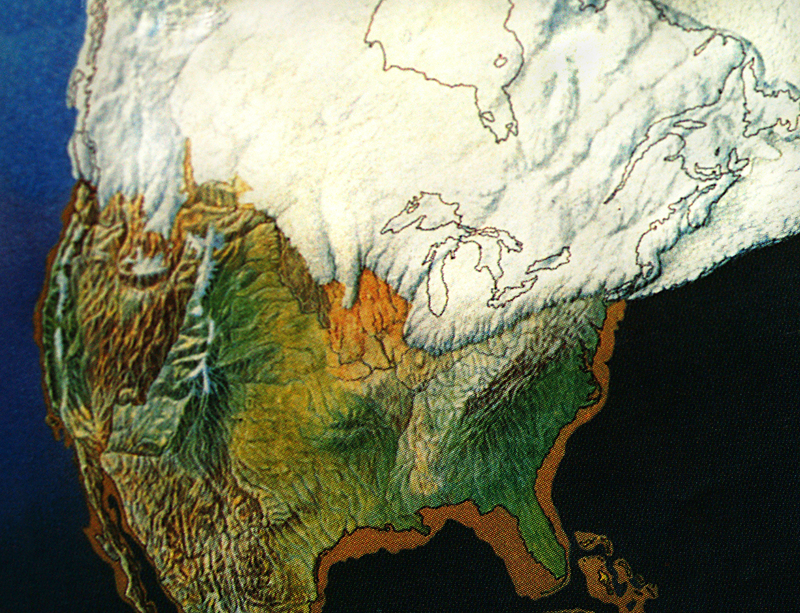 At its largest, it covered an area five times as great as all of todayís Great Lakes combined. Geologists have looked for, and failed to find, clear evidence of Lake Agassiz shorelines in Quetico. Since Lake Agassiz existed for a relatively short time and its level rose and fell depending on the rate that water entered, it didn’t leave obvious shorelines in the Quetico area. It is thought that the water in Lake Agassiz rose to about 1340 feet, the level of Pickerel Lake today. Consequently, all of today’s lakes with an elevation of less than 1340 feet would have been part of Lake Agassiz. Only the southeast and south-central sections of Quetico were above the levels of Lake Agassiz. The lakes in these areas had shorelines similar to what exists today. Paleoindians were the first to see Silver Falls and Louisa Falls, the first to stand on the shores of Knife, Saganagons and Kahshahpiwi Lakes, the first to paddle Ottertrack and McEwen Lakes, and the first to portage into Silence Lake and Other Man Lake. When Lake Agassiz covered most of Quetico it would have had numerous islands, much like those that dot Wicksteed Lake in this photo. The islands, however, would have had tundra vegetation. the tops of cliffs and hills would have protruded from the water. Lake Agassiz must have looked much like Wicksteed Lake does today. It was a lake with numerous shallows and was loaded with islands. Lakes like Beaverhouse, Crooked and Sturgeon were probably under more than 100 feet of water when Paleoindians first entered Quetico. Only the tops of the high hills and cliffs would have protruded from the waters of Lake Agassiz. What are now rapids on the Maligne River were then calm places in the depths of Lake Agassiz. When the glaciers retreated farther north and the drainage to the north was no longer blocked, the levels of Lake Agassiz dropped fairly rapidly and lake levels similar to those found today were established. This is thought to have occurred about 9,500 years ago, when Paleoindians still lived in Quetico. Compared to todayís Quetico, the most striking difference faced by the first Paleoindians (other than the elevated water levels and larger rivers and creeks), was the difference in vegetation. For the first few hundreds of years, there were no trees and the area was tundra. The wildlife was as different as the vegetation. Barren-ground caribou were definitely present, as the 10,000-year-old caribou antler from just north of Atikokan clearly shows. Other animals that occupied this rich, grassy, tundra-like landscape may have included woolly mammoth, mastodon, musk-oxen, giant bison, dire wolves and other megafauna from the end of the ica-age. Most of the megafauna from the last ice-age became extinct about 10,000 years ago, about 1,000 years after the retreat of the last glacier through Quetico. So it is possible that ice-age megafauna inhabited Quetico during this time period. There may have been packs of 200-lb. dire wolves chasing musk-oxen near Saganaga Lake, and sabretooth tigers may have pounced on barren-ground caribou from low cliffs along That Man Lake. Since the time between the retreat of the glacier and entrance of humans isnít known, itís not certain that people and woolly mammoths were in Quetico at the same time. The Quetico of the Paleoindian period differed in more than just water levels, vegetation and wildlife. Knife Lake has shorelines composed of a rock known as Knife Lake Siltstone. It is a coal-black rock whose surface takes on a lighter color as it ages. With time, the black rockís surface lightens to a dark grey and, after thousands of years, its surface becomes a light grey. Today the shoreline is a nondescript light grey, but imagine the spectacular site Knife Lake must have been to the first Paleoindians to reach its shores. In late winter, the coal-black rocky shoreline would have stood in shocking contrast to the snow and the ice on the lake. When the water is high, the Falls Chain can be a challenging place to canoe. Imagine what it would be like if the amount of flow was increased by 5 to 10 times. The flow of the creeks and rivers coming into Quetico was probably at least that much greater when the glacier was retreating. The trips down the Falls Chain into LakeAgassiz that the first Paleoindians made must have been exciting, and at times very treacherous. Many of today’s portages would have been underwater and they may have used very long portages to avoid the fast, dangerous sections. The forerunners of today’s Wawiag and Cache Rivers were also once large rivers carrying large loads of silt and sand into Lake Agassiz. When Lake Agassiz retreated, most of the silt and sand was left above the level of the lake left behind, now known as Kawnipi Lake. The Wawiag and Cache Rivers, now only a fraction of their former size, slowly meander through a wide, sandy clay plain that was formed by the glacial debris they carried into a bay of Lake Agassiz. The huge amount of sand and clay that now forms the banks of these rivers is a reminder of a monstrous lake that no longer exists. 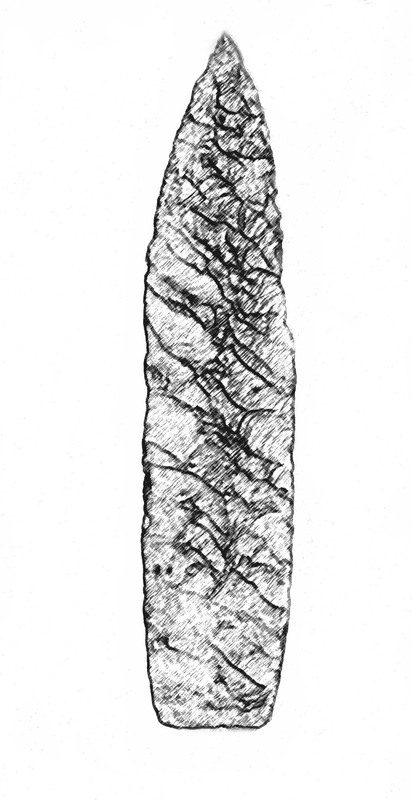 A Late Palaeoindian spearpoint found in Quetico Park. Paleoindian spearpoints have beenfound near the shores of Lake Agassiz and Paleoindians probably paddled and fished its waters and explored and hunted its islands. They undoubtedly established many of Quetico’s portages and were the first to use many of its campsites. It is intriguing to think that at least some of Queticoís portages may have originated even before the arrival of the first humans. Loren Eiseley, an anthropologist and writer, once speculated that humans first moved across and explored the Americas by following the trails of the animals they hunted. The evidence for the first human inhabitants of the Americas, the Paleoindians, are spearpoints, knives and scrapers . . .
associated with the bones of extinct horses, camels, sloths and elephants is clear and precise evidence that he was relying heavily upon big game for his subsistence ñ big game that moved in the open, fed upon grasses and left plainly marked trails. In every major continent to which the great herbivores have penetrated, there once ran a series of game trails beaten into the landscape by millions of feet. The trails led to everything that man desired. They ran to water, they ran to salt licks and they found their way across the lowest divide . . . Certain it is that he must have marched on many a well-word trail left for him where, ironically, no human foot had ever trod. Humans, looking for the easiest route from one lake to the next, may well have followed the trails made by the animals they were hunting. While it seems irrefutable that many of Queticoís portages date all the way back to the Paleoindian people, some may even pre-date those early inhabitants. They might have originated with the heavy feet of ice-age mammals, and these trails were followed and transformed by Paleoindians into portages. The human habitation of Quetico has apparently been continuous since the Paleoindian period. The long Native American presence in Quetico is evident in the name of lakes and rivers. Many, such as Keewatin, Kasakokwog and Batchewaung, still have their Ojibwa names. Others, including Sagnaga, Kawnipi, and the Wawiag River, have Ojibwa names that have been condensed, altered or shortened. Knife, Crooked, Ottertrack and Sturgeon are examples of lakes whose names are straight translations of their Ojibwa names. The legacy of the earliest explorers not only lives on in place names and pictographs, but also in their descendants. Many Ojibwa with ties to Quetico live in nearby communities in both Minnesota and Ontario. The closest and most obvious are the people from the Lac la Croix First Nation, a community of about 300 people on the southwest boundary of the park. The Ministry of Natural Resources and the Lac la Croix First Nation recently agreed on a partnership regarding the management of the park. European cultures and Native American cultures have interacted and influenced each other for about 300 years in this area. Just as European beliefs and values have crept into Native American cultures, so have Native American beliefs and values become part of non-Native cultures. Through paintings, literature and personal contact, many Native American beliefs are now woven into the fabric of contemporary Canadian and American culture. Much has also been lost in the millennia since Paleoindians first entered Quetico. The woolly mammoth, giant bison, dire wolves and other ice-age megafauna have long been extinct. They have been replaced with wildlife that, in their own way, are as impressive as what came before them. Moose, white-tailed deer, timberwolves, black bear, lynx, martin, fisher, bald eagle, osprey and loons are found in relative abundance in todayís Quetico. The grassy tundra-like landscape that the ice-age megafauna thrived on has slowly evolved into todayís diverse habitats. Since Quetico has evolved through time periods when it was both colder and warmer than it is today, it contains both Arctic and southern plants. You can now find Arctic plants like snow-white cinquefoil and floating marsh marigold, and more southern species like silver maple, basswood and wild ginger.